This small Genesis grill has all of the features of the larger grills in this line, but with fewer burners and a more compact footprint. You still get 380 square inches of cooking space, along with 114 square inches of space on the warming rack that tucks away when you don’t need it. The cooking grates are porcelain-enameled cast iron that heats evenly, cleans easily, and creates impressive grill marks. They are reversible, so you can cook on thin rods when you’re cooking delicate foods, and cook on thick rods when you want that impressive sear. The burners are stainless steel so they won’t rust or corrode, and there are porcelain-enameled Flavorizer bars protecting them from food drippings so you won’t get flare-ups during cooking while creating flavorful smoke. The side trays are stainless steel and include hanging hooks for your tools, and the open-cart gives you space for your propane tank and supplies. A grease management system makes cleaning easy when cooking is done. While cooking over a fire can certainly be appealing, using an electric grill has many benefits. For one thing, there’s no need for charcoal or gas tanks that need to be replaced, and you don't have to worry about live fire. And if you purchase a small electric grill like this one, you can take it on the road and use it on vacation (or anywhere you have electricity). The Weber Q-1400 has a total of 189 square inches of cooking space and a 1560-watt electric heating element that heats efficiently. 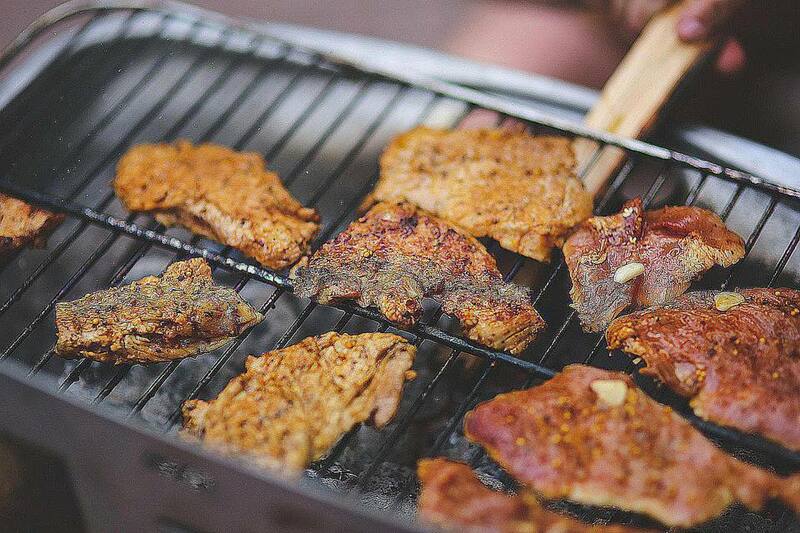 The grates are porcelain-enameled cast iron, so you’ll get great grill marks. 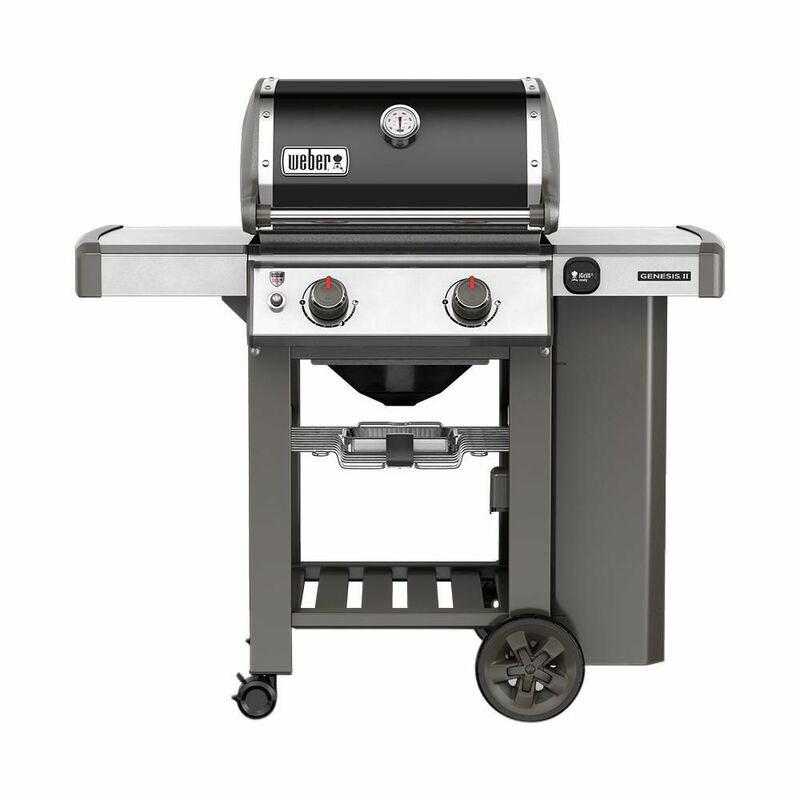 The lid and body of this grill are aluminum and the frame is glass reinforced nylon, reducing the weight to make it easier to move(also making it rust-proof). A removable catch pan makes cleaning easy when cooking is done. This has a 6-foot cord, so you’ll need to use it close to an outlet. It is for outdoor use only. See more reviews of our favorite electric grills. One good reason for cooking outdoors in the summer is to keep the heat out of the kitchen, but it seems like there’s always a side dish or sauce that needs to be simmered on the stove. This grill has a side burner, so you can simmer while you grill. This has 280 square inches of cooking space, two burners, and 20,000 BTUs of cooking power from the stainless steel main burners. Plus, the side burner offers an extra 8,000 BTUs of cooking power. The cooking grates are coated with porcelain for stick-resistant cooking and easy cleaning, and metal side shelves give you space to hold sauces, plates, and tools. The body of this grill is crafted from porcelain-coated steel for durability and two large wheels underneath make it easy to transport. Still can't decide on what you want? Our round-up of the best gas grills under $250 may help you find what you're looking for. This is a classic kettle-shaped charcoal grill but in a smaller size—just 14 inches in diameter—so it’s perfectly portable, whether you want to move it around your yard or bring it with you on a road-trip. The body and lid are rust-resistant porcelain-enameled steel, and the cooking grate is plated steel for rust resistance and easy cleaning. Temperature can be controlled using the dampers that regulate airflow, just like on larger kettle grills. A bottom tray collects as and small bits of charcoal for neat grilling and easy cleaning. Users have mentioned that although this is a no-frills grill, it’s very durable and resistant to harsh weather. Interested in reading more reviews? Take a look at our selection of the best charcoal grills. Infrared cooking reduces flare-ups while cooking food quickly and evenly, and since this is electric, you don’t need to worry about buying charcoal or keeping a propane tank handy. With a generous 240 square inches of cooking space plus an 80-inch warming rack, you'll be able to sear your favorites meats with room to spare. Two side shelves give you space for condiments and tools, then they fold down for more compact storage. A shelf under the grill gives you space to hold supplies while you cook. The cooking grates are porcelain-enameled cast iron for easy cleaning and even heating, and the grease tray is easy to reach when it’s time to clean the grill. The grill body and lid are made from porcelain coated steel that’s resistant to rust, and two large wheels make this simple to move. Natural gas makes grilling very convenient since you won’t need to buy charcoal or swap propane tanks. All you need is an outdoor gas hookup, and you simply turn on the gas, fire up the grill, and you can start cooking in no time. Like other Weber grills in this series, this has porcelain-enameled cast iron cooking grates that are easy to clean and create great grill marks. They are also reversible, so you can cook on thinner or thicker bars, depending on the food you’re cooking. The porcelain-enameled Flavorizer bars keep the two burners clean and vaporize drippings to create flavorful smoke. This provides 450 square inches of cooking space plus 90 square inches on the warming rack. Two side shelves give you room for condiments and sauces, and tool hooks let you keep your cooking tools and grill brushes nearby. The left shelf folds down to save you space in storage or on a small deck. An open cart with a bottom shelf also allows you to store supplies, and the grease management system makes cleanup a breeze. Check out our guide to the best Weber grills you can buy today. Pellet grills tend to be large and expensive, but this budget-friendly option has a smaller footprint and it's WiFi enabled. It boasts many desirable features that you’d typically find in larger grills, like a thermal sensor that constantly monitors grill temperature, and a digital controller with WiFi that can connect to an app on your iOS or Android phone. This pellet grill is also portable, so when you want to store it or take it on the road the legs fold up and you can use them as handles. Since it’s built for travel, you can plug this into a standard electric outlet, but it also comes with adaptors for other power options (you can run this on 12V on the road). As far as storage, the peaked lid allows you to cook taller foods with the lid in place, and a wire side rack with tool hooks gives you space for sauces and tools. Best known for their line of countertop contact grills, the George Foreman company also manufactures other grills such as this innovative electric pedestal grill that can be used indoors and outdoors. It’s great for cooking on the balcony when the weather is nice, but you can also use it inside when it starts to rain. The temperature control gives you a choice of five settings, and for added versatility, the grill can be removed from the stand so you can use it on the counter. The smaller footprint still provides you with 240 square inches of cooking space on a nonstick surface. The slightly sloped drip tray collects grease and drippings, and it can be tossed in the dishwasher for easy cleaning. The grill plate is also removable for hand washing. Our reviewers spent 25 hours testing two of the most popular small grills on the market by setting them up at home and cooking dinner for themselves and their families. To ensure the most comprehensive feedback possible, we asked our testers to consider the most important features when using these small grills, like amount of cooking space, ease of use, and portability. We've outlined the major takeaways here so that you, too, know what to look for when shopping. Cooking space This is a consideration for just about every grill, but it’s possibly more critical with small grills. When you’re cooking dinner for the family, can you fit everyone’s burger on the grill at the same time, or will you be cooking in shifts while you’re trying to keep everyone’s food warm enough to eat? The key is to get enough grill but not too much. Portability While all of these small grills are somewhat portable, some are designed to be brought out of storage when you need them, while others are designed to have a permanent space in your outdoor area. Your lifestyle and space will let you know which grill is best for you. Fuel type Some people say that charcoal gives the best flavor, while others prefer the convenience of propane. Meanwhile, there are folks who can’t have a live-fire grill on their balcony or deck, so electric grills are the best option. 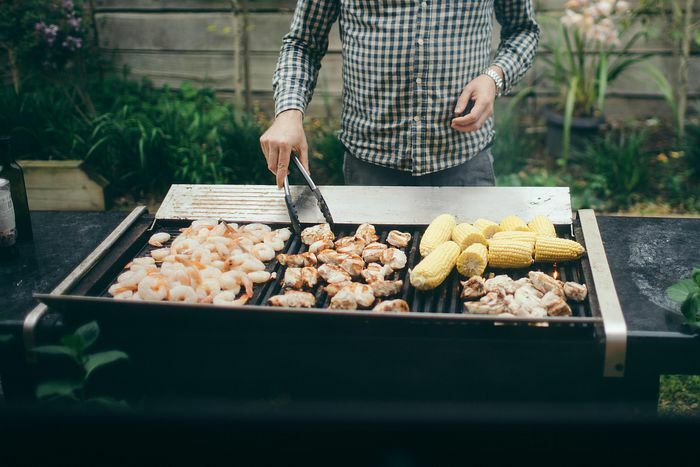 Each type of fuel has its pros and cons, but no matter which you choose, you’ll be enjoying outdoor grilling on any of them. If you’re not looking for a charcoal or gas grill, our testers thought this model was a great alternative. “It's compact and easy to use once it's heated up,” reported one reviewer, who cooked burgers and hotdogs and was satisfied with their quality. However, one of our testers found that the grill was a bit difficult to clean. Pro tip: Make sure you have a metal grill brush to make the process go a bit more smoothly. Char-Broil Patio Bistro Infrared Gas Grill: Need Something Small?